PRIME 2.0 is a resolution-agnostic solution that leverages GPU and CPU technologies for maximum power in rendering graphics and effects. With the ability to output graphics and clips through a single system that formerly required multiple solutions, users gain more functionality and features at a lower cost. Among other features, PRIME 2.0 introduces Clips PRIME, a highly flexible broadcast clip player with the ability to support up to six independent channels of video from a single server. With Clips PRIME, PRIME is introduced as a fundamental element in the CAMIO Universe, a comprehensive software-based ecosystem that empowers producers and journalists to create compelling broadcasts and deliver them rapidly to air. The full integration with CAMIO, ChyronHego’s MOS-based and NCRS-connected graphics asset management solution, gives broadcasters the ability to extend their newsroom facilities significantly. For example, a newsroom user will now be able to perform operations such as selecting a PRIME clip or scene to add to a story, and to type content/drag graphics into a data field to be output to a ticker. 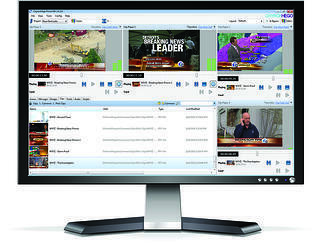 ChyronHego’s PRIME is already delivering unequalled power and a stunning return on investment to facilities worldwide. The future-proof foundation of PRIME 2.0 now gives you supercharged rendering power and unprecedented clips management – preparing you for the broadcast demands of today and tomorrow. Intrigued? Download our White Paper to learn more about the PRIME Ecosystem.